March | 2006 | Planet Geek test site. A view from my office! Okay, not exactly. Today I had a bunch of errands that required me out on the road, including dropping the van off to get a trailer hitch put on. This of course left me without net connectivity (GASP!) for several hours, as my laptop is still in the Laptop Medical Center undergoing major surgery. What an excellent opportunity for a bikeride! I brought the recumbent with me, and after dropping the van off, loaded up my gear and headed off. 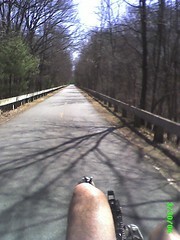 My route took me from Waltham into Lexington, onto the bike trail (see picture), and out to Bedford, and back. Along the way I took and placed a few phone calls, eliciting odd looks from folks as I chatted away on my headphone while biking along. After returning, and noting the van wasn’t done yet, I went into town and had lunch, and rode back. My bike computer said around 21 miles, but goole pedometer says 18.8. I trust my bike computer a bit more on this, I think, since it took into account all the little noodling I did along the way. My first serious bike ride of the year. It was an invigorating ride all told. Weather was EXCELLENT (at the moment my outside thermometer says 71 degrees. Woo! ), and I suspect I even got a little suntan out of it. During one particular sprint, I realized I had shifted to my large front chainring, and was pumping away at a good pace. Looking down at my bike computer, it happily proclaimed 27mph, which is haulin for what is basically a very gentle downslope. I was in the groove! I was able to hold this mode for about 15 minutes, between Lexington and Waltham. I now see the attraction to riding in town, in traffic, when in shape. I can’t hold onto it very long, I just don’t have the muscles or lung power for it, but I can see it coming. In which Dave loses any free time he has. It really was just a matter of time. I had been fighting the temptation for years. It wasn’t difficult, the offerings were tantalizing, but not enough to really make the committment necessary. And if I was going to do it, I wanted to make sure it was the right decision, at the right time. Alas, that time has arrived. On Thursday, I made my payments, downloaded my software, and signed into Eve Online, an MMPORG. For those not into geek anagrams, an MMPORG, or ‘Massively Multiplayer Online Roleplaying Game’, is an online game where you as a player are just one element in a large scale universe populated by other gamers from all over the world. Generally these games have thousands, tens of thousands, even hundreds of thousands of players online at the same time, some interacting with each other, some working in teams, some playing individually. Some of the more famous MMPORGs are World of Warcraft and Everquest. They’ve been enormously successful, with huge player bases and serious player involvement, to the point where the MMPORGs become their own functioning economies, even spilling over into the real world. Eve Online takes a somewhat different tack on the MMPORG concept. Where other games and environments have focused on sword and sorcery, as well as personal character development and interaction, with characters building skills, experience, collecting items, completing quests, etc, Eve Online chooses a different tack. The background is the human race expanded out into the galaxy, and found a wormhole to a far remote galaxy. They expanded through that wormhole for many hundreds of years, then the wormhole collapsed, cutting off the huge industry that had sprung up in the remote environs. Large corporations came to dominate the environment, factions grew, and tensions rose. Now a sort of detante has settled, with 4 major clans in control, with dozens of huge corporations, and thousands of small ones, all vying for economic and political control. The game is enormous… hundreds of systems each with planets, moons, and asteroids colonized and built out. You control your own ship, which can be anything from a small trading frigate up through enormous capital ships. There’s a strong economy and scaled model for how to build up your ship, skills, supplies, connections, and allegiances, with a virtual infinate number of paths a player can take to build up their career. At the moment, my ship is happily docked in a station while I go through skills training, but next time I’m online, I’ll probably take it out to do some asteroid mining – a relaxing pasttime that allows a properly configured ship and prospector to mine ore and bring it in for reprocessing to generate income. This is just one of many ways to make money in the game, money that can be used to buy new equipment for your ship, buy skills training, invest in trade goods, and continue expansion. I enjoy the game enormously for any number of reasons. The first is it is absolutely stunning visually. I was unsure about the heavy toll it would extract on my gaming machine (however it wouldn’t be the first time I upgraded my PC specifically for a particular game), but my Athlon 2800 + nVidia card seems to be handling it just fine at 1280×1024. My first take on the imagery reminded me a lot of Homeworld, with the tactical display and ‘jetstreams’ showing ship vectors, but it quickly became apparent the folks doing Eve put a LOT of effort into the interface to support the levels of communication needed to function in the Eve economy. I’m up to 3 days on the game so far, and I can see very careful metering of my own time will be necessary, though I do like that certain tasks in the game can take up quite some time (for example, laying in a multi-jump course thats going to take me across 5-6 star systems, and setting the autopilot to execute… can take a half hour to complete the navigation. Excellent time to catch up on neglected work.) I’ve found the folks online to be very into the game and helpful, giving good suggestions and help when needed. The hordes of 12 year old kiddies with big swords doesnt seem to be happening in Eve, which I’m eternally grateful for. Now, here’s the fun part. I’m a paid user now, ergo I have ‘buddie’ accounts I can give out. Interested in trying it? Let me know, I can provide you with a 15 day trial account. Give it a try. First one’s free. We’re doing more and more ‘music hangouts’ hereabouts, and I’m looking for suggestions on what sorts of music we should be adding to our ‘songbook’. The standard fare are entries from Rise up Singing, but I’m looking to widen out the offerings. We’ve added things like Allman Brothers – “Melissa” and the like, plus some Chicago, a lot of CSN&Y, Indigo Girls, things of that nature. If you were having a bunch of folks over, and wanted to play music together, with a bent toward classic rock and folk tunes, what would you add to the list? I’ve added a list of the tabs I’ve already collected behind the cut. The best type of songs are ones that play well on acoustic guitar, bass, and a hand drum. Good choral vocals are a win. Occasionally we have more involved musicians playing, so woodwinds or other instruments are often added, but it’s generally a few 6 and 12 string guitars, my bass, and the singers. Categories : Laugh it up, fuzzball. I found this icon while surfing various other postings and misc communities, and I just stared at it for a good 15 minutes. It illustrates perfectly how a sewing machine works. For some time now, Barb and I have been using Wengo for video and chat calls. It turns out, the kids love it almost more than we do. THis is Zach (sitting at my desk), talking with Justin (who is in Pittsburgh, 600 miles away), and just hanging out together. They ended up spending 2-3 hours just playing around, showing off stuff they were doing – heck, they even ‘shared breakfast’. Isn’t this the space-age video phone technology that we were always told would come? Now I want my flying car! Quickies. 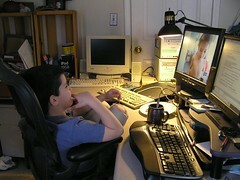 Videos, games, treo, and laptops. Ah, why not a quick bunch of updates and other tidbits. The other night I finally sat down and updated the inventory of all my DVD’s and Laserdiscs. Having picked up a crateful of discs from someone on GB-Reuse, I figured it was time to update the listing. It’s just a flat text file – yeah, so retro, huh? Anyway, here it is. I thought I actually had more than that, but it’s a little over 200 laserdiscs, and about 110 DVD’s. One of these days I’d like to integrate my MythTV server and an installation of ReaderWare, the awesome book / video / music database tool. My Treo has been replaced and I’m up and functioning again after the unfortunate incident. I had insurance on the phone, Verizon’s agent did a replacement / swapout for $50 (since it wasn’t actually a ‘failure’ on the device. I basically abused it. Edgy definition there). Thanks to the wonderful Lisa, I’ll have a new belt case to work with. I’m disappointed in the Seidio shield holster. The treo can pop out of it too easily, and I’m constantly checking on it. Stay tuned for more updates on what I end up with. The laptop is still out of action, but I’ve done the external 2 1/2″ drive mount thing, and there was no data loss. ‘yawl’ is doing just fine as my desktop machine, and the laptop is basically turned off and tucked away. It’s a little odd not having a mobile machine to work with – I can’t just pack up and go to the local restaurant to work. I’ll need to get the laptop going again soon. In the funland department, Zach and I dug up some old hardware in the basement and got the DDR setup going on the Playstation again. We last played a lot over a year ago, and he’s improved a bunch since then. I think we’re hitting the sweet spot for rhythm and organization for him, and he’s close to giving me a run for the money. And I’m certainly not going to argue with the exercise. I’m thinking it’s probably time to replace the playstation though. The PS1 is almost 12 years old now, and the Playstation2 can be gotten for $75-ish, it just doesn’t make sense to stick on the old platform, particularly when we’re starting to see some minor twitches. And judging by the games I saw at Ubercon (like Shadow of the Colossus, the PS2 is not only a quantum leap in performance over the PS1, but despite it being 6 years old, the PS2 is still an awesome gaming platform.